Quickly compare inhaled treatment options for your COPD patients with the MIMS table of COPD combination inhalers. 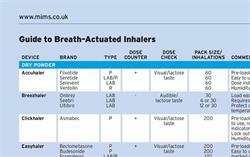 The table provides essential information for healthcare professionals prescribing a dual or triple combination inhaler, either when stepping up treatment or when starting a combination inhaler in patients already adequately controlled on separate devices. It can also help prescribers looking for an alternative combination device where the existing choice is unsuitable.